According to U.S. Assistant Secretary Victoria Nuland, the United States is eager to deepen its involvement in helping the parties to the Donbas conflict achieve the full implementation of the Minsk peace agreement, ensuring the OSCE access all along the Ukrainian-Russian border to fully inspect any cargo coming into Ukraine. "As I said, our main message here was that the United States is prepared now and actively engaged in deepening our engagement, deepening our support for seeing Minsk fully implemented in all of its aspects – in a security aspect, in a political aspect and with regard to humanitarian relief, with regard to the border," U.S. Assistant Secretary of State for European and Eurasian Affairs Victoria Nuland said at a press conference at the end of her visit to Kyiv on May 14-16. She also said she had had a chance to get a "first-hand feel" for how the reforms in Ukraine were proceeding and talk to the Ukrainian side about constitutional issues and decentralization. 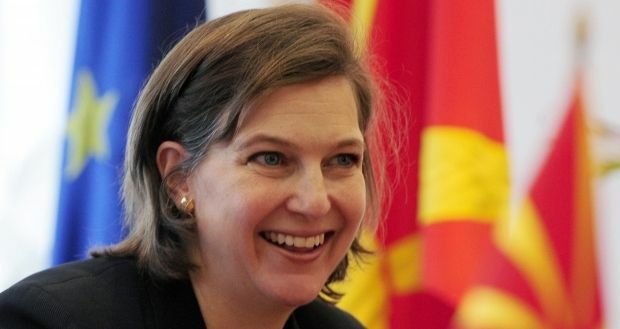 Nuland said the work of the OSCE mission in Ukraine had been discussed with the Ukrainian side. "So we talked very specifically about how the OSCE can play an enhanced role in protecting Shyrokyne while ensuring that the Ukrainian side can continue to defend Mariupol," she said. "We talked about the absolute necessity of ensuring that Minsk is fully implemented on the border, which means that the OSCE should be allowed access all along the border, and any cargo coming into Ukraine should be fully inspected," she added. According to her, the engagement of the humanitarian working group of the Normandy Trilateral Contact Group was also on the agenda of her talks with the Ukrainian officials. "We talked very specifically about how to use the humanitarian working group of the Normandy Trilateral Contact Group to get more humanitarian assistance to the people of Donbas," she said. "It's my first visit since I was here with [U.S.] Secretary [of State John] Kerry in February. I leave here with renewed sense of optimism about the course that Ukraine is on. We know that what you're involved in is very difficult, that reforms are painful, but you're on the right course to a more democratic, cleaner, more European country," she stressed.